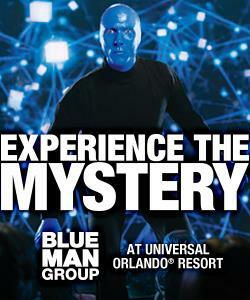 Blue Man Group Universal Orlando Resort discounts - Hotels Etc. Experience the wildly popular mix of music, comedy and multimedia theatrics of Blue Man Group. Their unique form of entertainment creates a blissful party atmosphere that people of all ages agree is a totally outrageous experience. World-renowned for their live stage shows, Blue Man Group now serves up their eclectic mix of live music, fantastic percussion instruments, and unexpected humor to Orlando—and the only place in town you’ll find a show as astounding as this is at Universal Orlando Resort. Experience two amazing theme parks, non-stop nightlife, and three world-class hotels—all within walking distance of the extraordinary Blue Man Group. Guests requiring handicapped seating should contact customer service at 800-927-6157 to make their reservation with a customer service representative. Rates below are applicable.